Well, I am here in Massachusetts with my friend Pam in her peaceful home in a lovely rural area. It was a rough trip with burning smells in the aircraft cabin forcing the flight to land in Orlando where swarms of Brazilian children clutching Mickey Mouse dolls were also stranded due to thunderstorms. This meant arriving in Boston in the wee hours of the morning where I probably caught about 90 minutes of sleep on the airport floor before the early flight check-ins brought in the excited hordes. But…I am here and I have a few tidbits to share…some interesting things that I have seen in the day and a half I have been here so far. 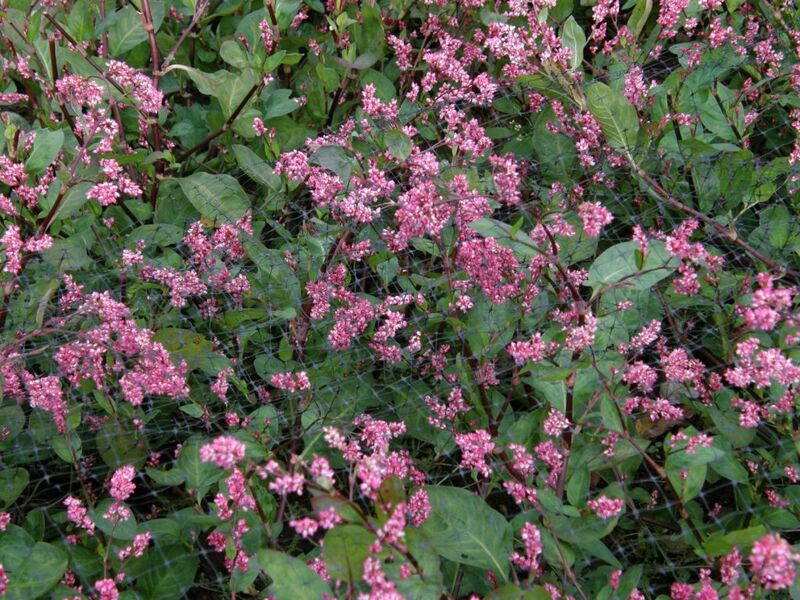 Firstly, the skies cleared today and I got to go out and see Pam’s indigo crop. Hopefully we will harvest some leaves and do some dyeing during my stay. Pam has done it before with her own plants and so I am looking forward to learning a lot. We pulled off a leaf today and scrunched it about and left it to see if there were any signs of blue as this is apparently a way to see if the leaves are ready for picking and, yep, a few hours later when we remembered to go look at it, the signs were there. 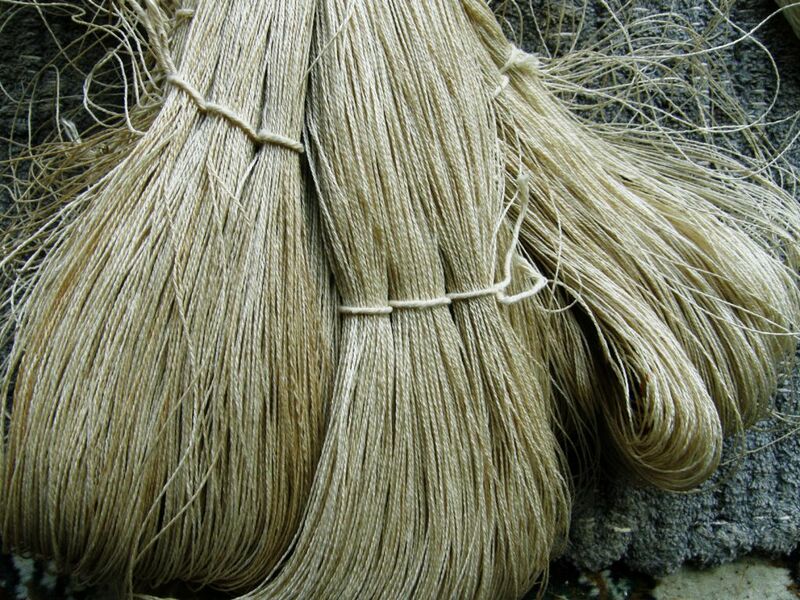 And this is what we are going to dye….silk! all the way from Uzbekistan. Here is the silk with its coating of sericin. I had no idea that this is how it looks and feels…stiffish…before being scoured with washing soda in simmering water. Fortunately Pam also has a lot of beautiful soft scoured silk all ready to be skeined for dyeing. 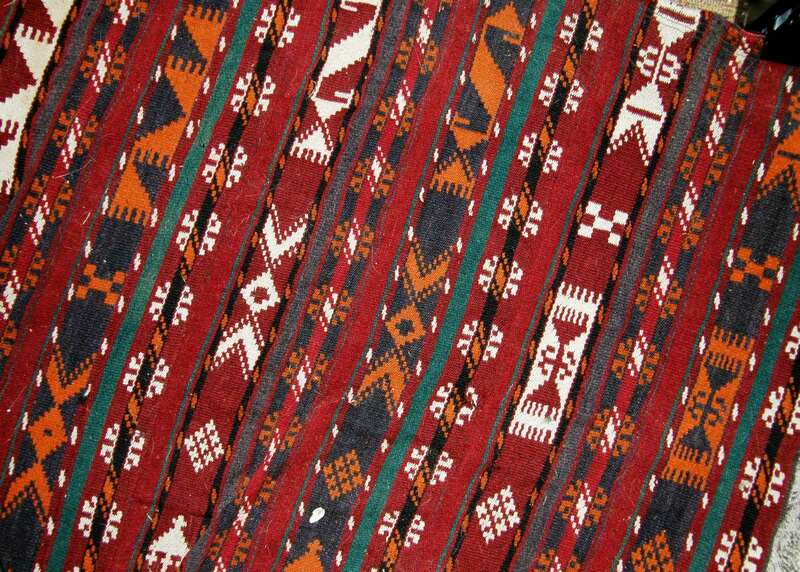 I spent the afternoon revisiting Pam’s collection of textiles from Uzbekistan. I posted them in a previous blog post but getting to see them again with fresh eyes is always welcome. 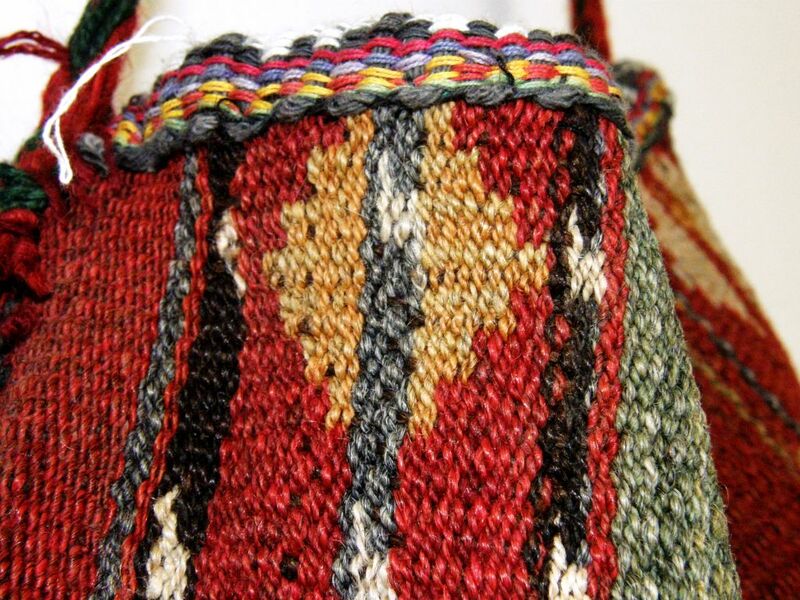 Even though these pieces were all bought on the three trips that Pam has made to Uzbekistan, some of the textiles actually originated in Turkmenistan. 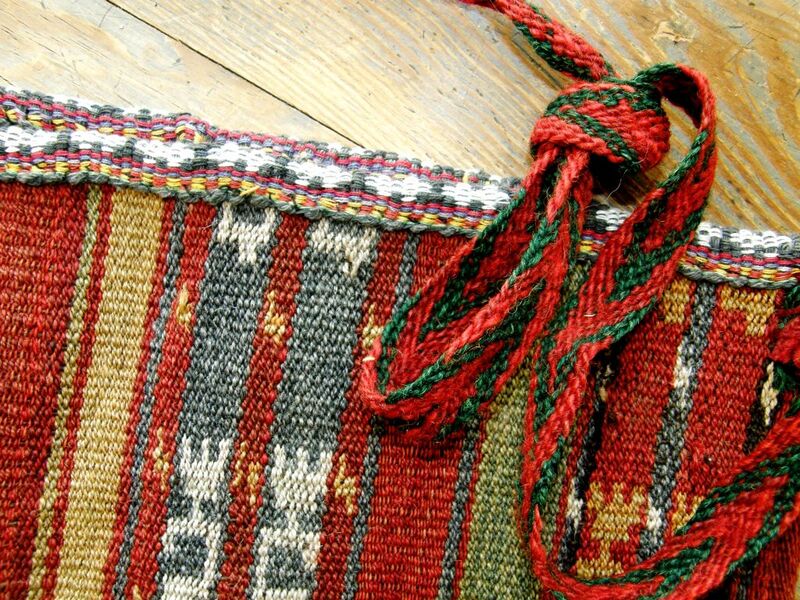 The rug and rug piece which has been sewn into a bag caught my eye as both have been made with the warp substitution technique. Who cares about long floats on the back when you have weaving in this beautiful handspun yarn and gorgeous color combinations. This is one of several rugs on the floor of the office in which I am sleeping. I love the fact that the long floats on the back of the piece give me a chance to feel and closely inspect the yarn. This is a piece of rug that has been made into a bag. You can see both faces of the fabric. I just love those washed-out reds and blues. 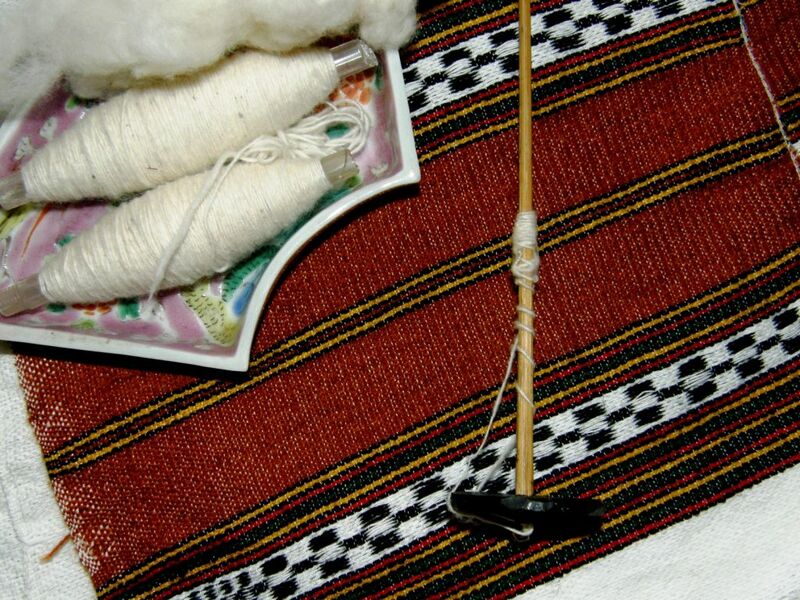 The rug was cut and then a woven band was folded lengthwise and sewn to the raw edges to cover and protect them. The strap is interesting. Doesn’t that look like finger weaving? I am pretty sure that this motif was done in three-color warp substitution. You can just make out two colors in the motif along with the red background. Only by looking on the other side where the colors were still bright you could clearly see the orange and green warp threads that alternate in this design. 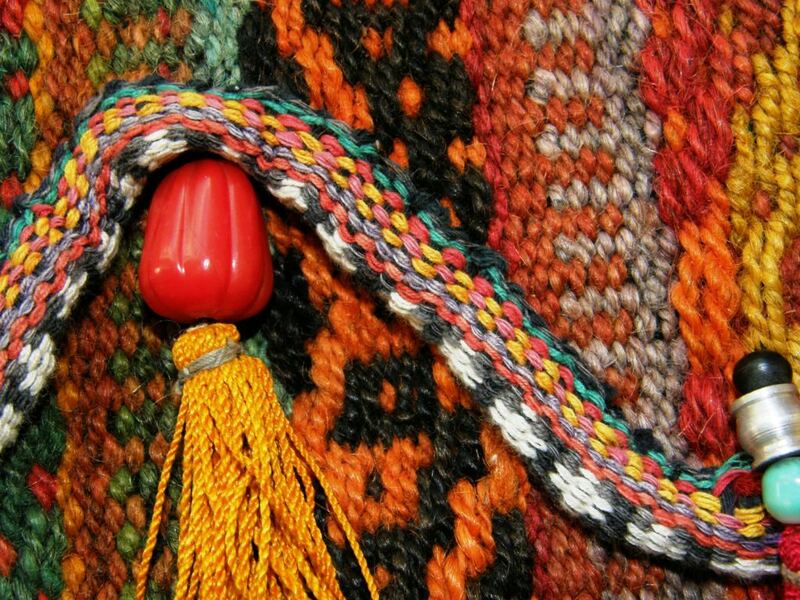 I am definitely going to cut a fancy flap and add some tassels to the next bag I make. I have just been getting confident with cutting and edging rounded flaps. Now look at this shape! This piece, which Pam says used to be part of a rug, is woven using the two-color alternating warp float method which I have been calling, for lack of a better name, “warp floats galore”. You may recognize the “S” motif from a belt, cell phone pouch and notebook cover that I made. The woven band has been sewn on beautifully and it all feels very secure. Little “comb” patterns separate the warp float bands and a simple warp substitution design has been woven into the edging band. 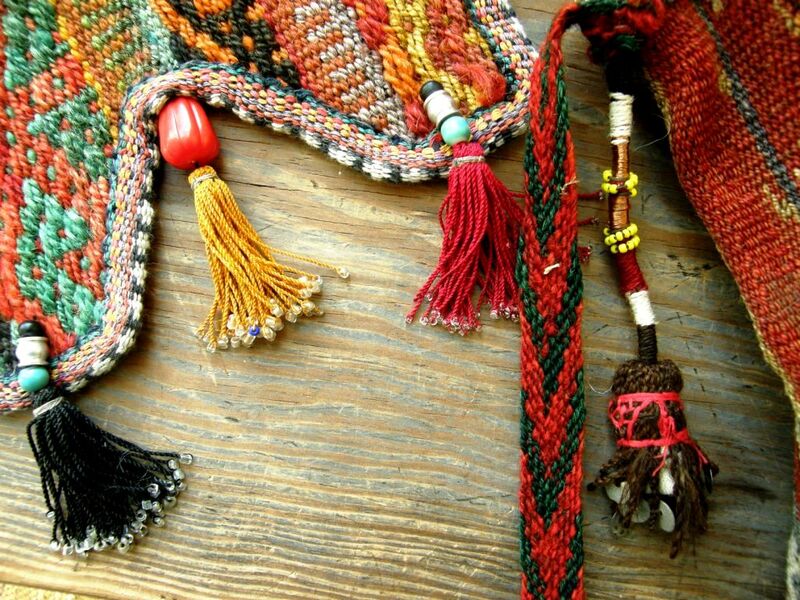 The fabulous tassels…one has embroidery on the outside and the one on the right includes copper wire in its wrapping. Here is a close-up of some of the warp float designs. 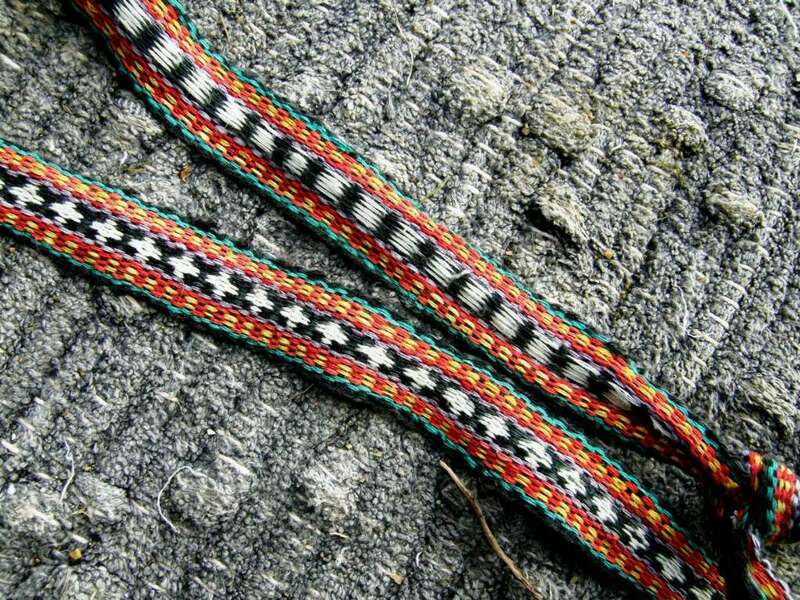 The bag strap has the same simple warp substitution design that appears on the edging. There is so much to be enjoyed in this one piece! There is plenty more to show and tell from Pam’s lovely weaving space and home but I told you that this would just be about tidbits and so I will end with something that Pam’s friend Joan showed me on a quick visit to her home in Worcester. I stayed with Joan and her husband Attila last spring. Joan introduced me to Saori weaving and took me to see Dar Ku, a Burmese weaver now settled in the US. Joan is involved with new settlers in her area coming from all parts of the world. She has recently made friends with a basket weaver from Burundi as well as with textile weavers from Bhutan. 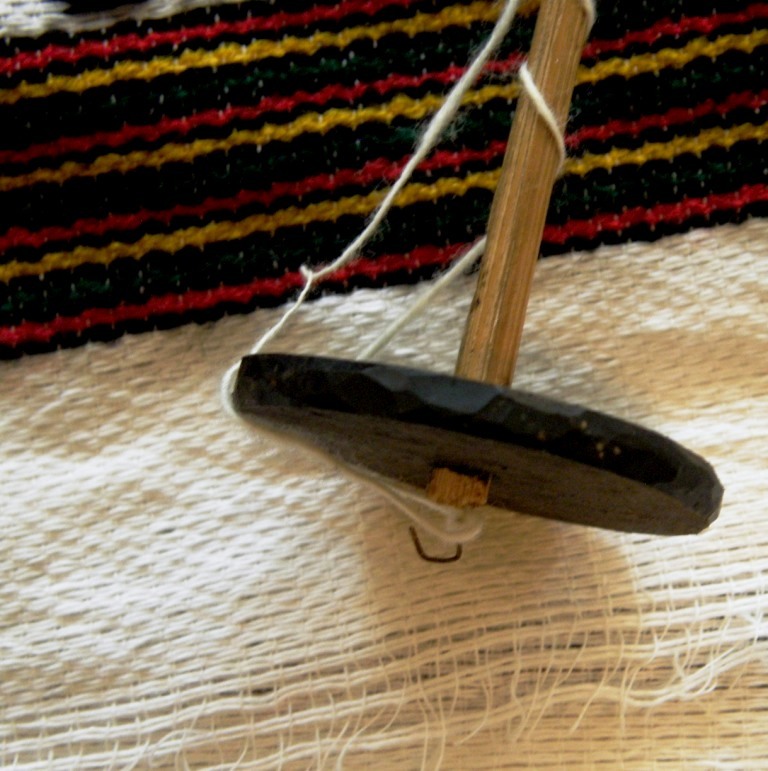 An Ethiopian lady showed her how she spins cotton and gave her a spindle, some of her spun thread and a piece of Ethiopian woven cloth…all gorgeous! A close up of the end of the spindle and the woven cloth…I didn’t have the right conditions in which to photograph this well. 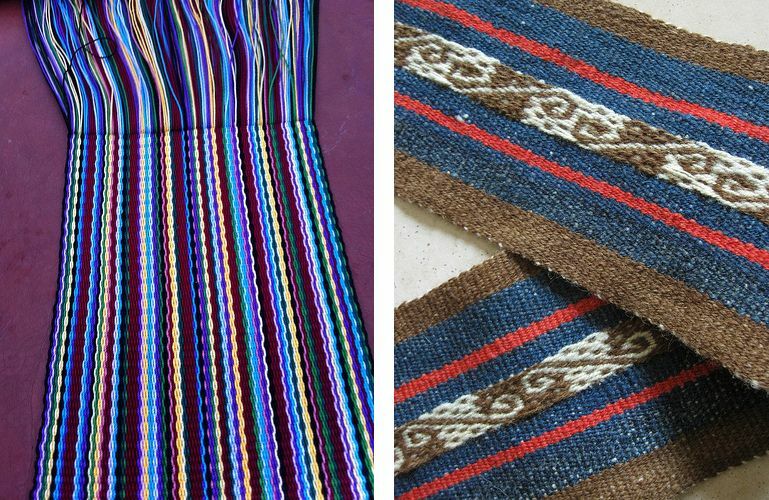 Unfortunately, lack of time won’t permit a return visit with Burmese weaver Dar Ku but I have posted a video I took last spring of Dar Ku at her backstrap loom weaving a supplementary weft design on warp-faced fabric. I am so glad to be finally able to show this. It took forever to upload! She weaves with the wrong side of the cloth facing her and carries her supplementary weft from place to place across the back to weave the parts of the pattern. She has a very soft beat and her tension seems to be quite relaxed. I am told that these weavers usually weave with their legs braced against something and that this has been difficult to set up in their homes. For now they are just doing without the foot brace. I am sure it must feel weird for them weaving that way. I wove once with Salasaca weavers in a shop rather than in their home where they have everything set up. They spent the whole time scrabbling about on the floor with their heels trying to get some purchase so that they could push and tension the warp more. Dar Ku on the other hand looks quite at home weaving with her feet crossed and not pushing against anything. 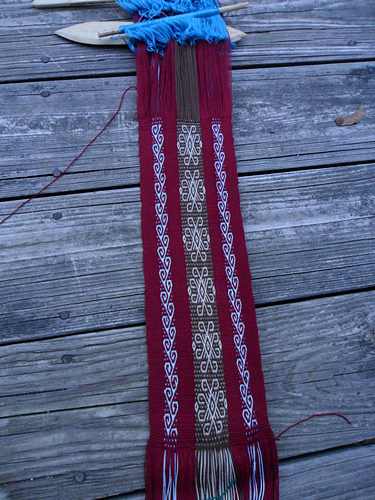 I love the way she opens the pattern heddles so delicately and smoothly. Everything just pops open so easily! It looks like the most relaxing effortless thing in the world. It is lovely to watch. How’s this for contrast…Jennifer is weaving a myriad of colored cotton stripes while Tracy just finished a pebble weave hanging with her handspun wool. Verena has also been weaving pebble weave and hopes to sew this into a pouch. Verena was my student here at Pam’s place last spring and has been getting on very well with her pebble weave since then. And lastly, I have some charting paper to share. Lately, I have been charting my double weave, warp substitution and supplementary weft patterns on paper with elongated ovals rather than diamonds. 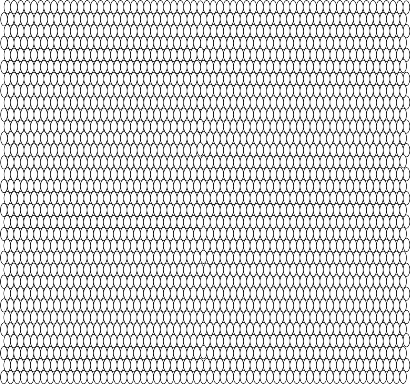 I made a sheet of ovals on a drawing program that I have and have posted it on this page for you all to use. I am so used to the diamonds but I think that these ovals may be easier to use. I have had people tell me that they go cross-eyed with the diamonds! I hope that this new charting paper helps. Here is what it looks like. The page with the full version is is linked above. Back with more travel tidbits next week. Have fun with the indigo! When it appears exhausted (not giving up any more blue, or much lighter), DON”T THROW IT OUT YET. If you have any other dye stuffs, try dyeing with them, then over dyeing with the exhausted indigo. Some friends of mine and I did that with a piece of fabric that had been dyed with turmeric, expecting some sort of green. We got a gorgeous crimson that we could watch wicking speedily up the fabric. It was awesome! May be just tidbits, but it’s as rich a post as ever. Those details of the textiles are divine!! Thanks for showing us so much of them. So glad you saw Ethiopian spinning, too! I recognize the staple hook, and the shaft looks like the same material as the ones I’ve seen, although the whorl is something completely different. Berta and I have just started looking into indigo, so I told her to check out today’s blog. Fingers crossed for indigo dyeing on Monday 🙂 Had to cover the plants tonight as frost is expected. Lovely reading and very inspiring. This makes me want to branch out a bit.